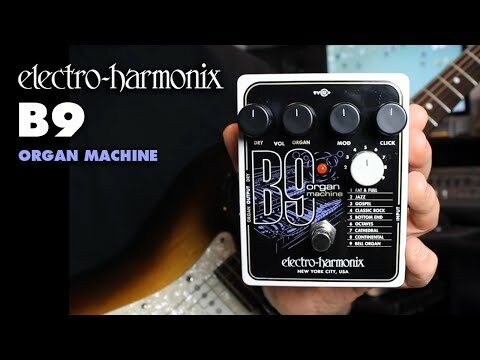 The Electro-Harmonix B9 Organ Machine pedal. FREE shipping anywhere in the USA! DRY VOLUME KNOB: Controls the volume of the untreated instrument level at the ORGAN OUTPUT jack. ORGAN VOLUME KNOB: Controls the overall volume of the ORGAN preset. MOD KNOB: MOD controls the speed of modulation. The type of modulation is contingent on the preset selected. The different types of modulation available are vibrato, tremolo and chorus. See the preset descriptions for modulation type. CLICK KNOB: CLICK controls percussive click level. It was designed to simulate the harmonic percussion effect on classic B3 and C3 organs. The click will be added to the very first note or chord played. The click will retrigger only when current notes have been released and their amplitude falls below a threshold. For a few presets, CLICK controls parameters unique to the preset. See the preset descriptions for details. BYPASS FOOTSWITCH: Press the BYPASS Footswitch to toggle the B9 between buffered Bypass and Effect mode. The status LED lights when in Effect mode. DRY OUTPUT JACK: DRY outputs the signal present at the INPUT Jack through a buffer circuit. ORGAN OUTPUT JACK: ORGAN outputs the mix set by the DRY and ORGAN controls. 1. Fat & Full- This sound adds an extra octave below and above to make your guitar sound twice as big. Fills out any band in an instant! MOD Type: Chorus. 2. Jazz- This preset has the cool, smooth jazz tone reminiscent of the late great organist Jimmy Smith. MOD Type: Chorus. 3. Gospel- This preset has the upper octave drawbars added to capture that great soulful organ tone. MOD Type: Chorus. 4. Classic Rock- This preset captures the classic rock sound of songs like Procal Harum’s “Whiter Shade of Pale.” Add a touch of distortion for a classic dirty organ. MOD Type: Chorus. 5. Bottom End- This preset has the lower draw bar sound. Perfect for adding bottom to your guitar or playing B3 bass sounds. With the CLICK control up you can lay down a bass line like the one on Sugarloaf’s “Green Eyed Lady.” MOD Type: Chorus. 6. Octaves- This preset uses the fundamental tone plus one octave above. This sound is great for songs like Led Zeppelin’s “Your Time is Going to Come.” MOD Type: Chorus. CLICK control adds not only key click, but higher harmonics. 7. Cathedral- Turn up the reverb and you are at the seat of a giant cathedral organ! Psychedelic rock tones easily pour out. MOD Type: Tremolo. CLICK adjusts the tremolo depth. 8. Continental- This is the classic combo organ sound similar to classic songs “96 Tears,” “Woolly Bully” and “House of the Rising Sun.” MOD Type: Vibrato. CLICK controls vibrato depth. 9. Bell Organ- If you crossed an electric piano with an organ this is it. MOD Type: Tremolo. CLICK adjusts the amount of bell or chime added to the sound.